Fusion in Chinese cuisine is the practice of combining disparate aspects of two provincial cuisines, or of Chinese cuisine and any foreign cuisine, to create a new Chinese dish. While overseas Chinese have opened restaurants the world over in the last 100 years, and have incorporated local ingredients and flavors everywhere as they adapted their own Chinese cuisine to new audiences, within China itself, fusion means combining disparate elements to create a new dish for Chinese diners. Defined this way, fusion did not even begin to creep into Chinese cuisine until the end of the twentieth century, for the idea of fusion is contrary to the way Chinese chefs have long thought about food. Chinese culinary tradition has always sought the perfection of a dish, not its reinvention; the purest provincial cuisine, not a new combination. In the past, fusion has not been a natural fit with Chinese cuisine. One historical illustration of this is the restaurant scene in Taipei in the 1950s. When the Nationalists fled the mainland in 1949 to establish their outpost in Taiwan, they brought generals representing every province… and those generals brought their chefs. Chinese provincial armies of the era always traveled with their chefs. Once settled, these top chefs opened their own provincial restaurants in downtown Taipei, often quite near each other. Each represented the pinnacle of his province’s cuisine. Henry Chang, a chef who trained in Taipei starting at age seven, has said of these chefs, “They were like Gods to us.” And yet, as Chang noted, they never mixed or traded or borrowed; each chef concentrated on the perfection of his regional style. It has long been typical throughout the Chinese culinary world for provincial styles to be offered separately, either in different restaurants or in different sections on a menu. Over time, Chinese cooking has also absorbed surprisingly little influence from foreign cuisines. This strictness of continuity places Chinese cuisine in the middle of longstanding Chinese aesthetic tradition, which throughout history has prized perfection over innovation, mastery over genius. Chinese art history is not a series of aesthetic revolts, as is the case with Western art; rather, great Chinese art forms, including food, have grown over centuries through accretion, progressive refinement, and evolving concepts of perfection. When the highest goal was mastery within great traditions, an artist, or a chef, did not try to do something new. For all these reasons, fusion has been slow to show up in China. Modern demographic changes, however, have forced increased blending and borrowing between China’s provincial cuisines. In 1938, for example, General Chiang Kai-shek, a Cantonese, moved his army into Yunnan Province to build the Burma Road in cooperation with British and American forces. Naturally his army’s Cantonese chefs came too. These chefs introduced steaming techniques from Cantonese cuisine, a lasting contribution to the cooking of Yunnan. A much more recent example was the migrant workers who brought provincial cuisines with them when they followed the construction boom of China’s modernization, beginning in the 1980s; they comprised the first big surge of the floating population, or líudòng rénkŏu (流动人口). First came the Uighurs of Xinjiang, who fanned out to run a black market in currency during the two-currency era (RMB and FEC), 1980-1994. Their numbers were far surpassed in the early 90s by the massive population of rural men, especially Hunanese, who moved to urban areas to work in construction. First, street stalls sprang up to serve the new arrivals, and soon the Uighur kabobs, or the spicy Hunanese fare, attracted locals as well as migrants. Then, Uighur and Hunanese restaurants began to open. Finally, the previously less-familiar ingredients and spices popped up in the city’s home kitchens. By then, home cooks were adapting provincial dishes to their tastes, and so were restaurants: a Hunanese dish in Beijing may be adjusted to suit the palate of the Beijing diner. Now, the Chinese economy currently supports an extraordinarily avid dining culture, especially among urban dwellers, who expect many provincial cuisines to be not only available, but, in some cases, tailored to local tastes. In this way, through restaurant chefs and home cooks alike, intra-provincial fusion is growing as the population gains a broader taste for the nation’s highly varied cooking traditions. Fusion between Chinese and foreign cuisines has been slower to catch on. In the 1990s oddities such as foie gras dumplings appeared, first in foreign-owned restaurants; now more sophisticated offerings can be found even in serious Chinese restaurants. 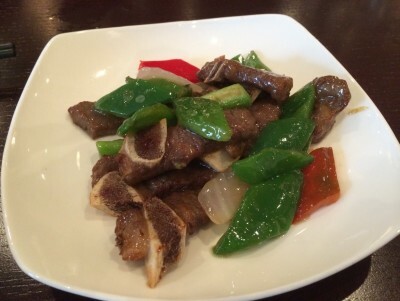 One example is the beef short ribs in wasabi sauce served at a Shanghai dim sum house, which combines a distinctly Japanese flavor with a classic Chinese recipe. At present, international fusion dishes can be found primarily in highly cosmopolitan cities like Shanghai and Beijing.